Scientists tracked down this lone Wolf-Rayet star deep in our galaxy and four that it was behaving in a most unusual way. It’s large, rapidly aging, and behaving in a way completely different than scientists expect — and this star could help scientists better understand the universe. 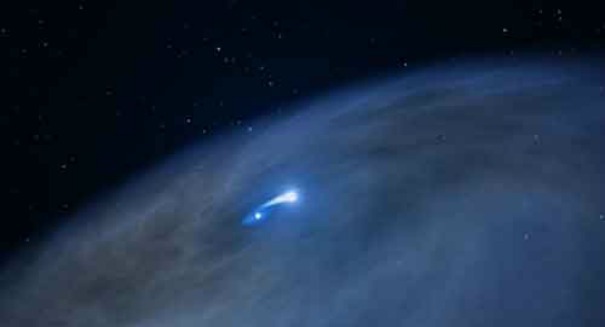 Called “Nasty 1,” it was first discovered 50 years ago (its nickname came from the catalog name of NaSt1) and is classified as a Wolf-Rayet star, which is a massive star that dumps its outer layers of hydrogen rapidly and reveals its extremely hot helium core within, according to a Gizmodo report. But there are plenty of Wolf-Rayet stars out there, so that’s not what makes Nasty 1 unique: instead, astronomers found when looking close at it via the Hubble Space Telescope that rather than twin lobes of gas flowing on opposite sides of the star like in other Wolf-Rayets, there’s a massive disk of gas orbiting the star. Scientists are theorizing that there is an invisible celestial body nearby, consuming the star and then expelling the matter in a high-energy event. According to Joe Mauehan of UC Berkeley, the lead author of the paper published in the Monthly Notice of the Royal Astronomical Society, Nasty 1 could be from a binary interaction, which would make what astronomers are witnessing an extremely rare event. Binary interactions are very brief and can last 100,000 years, and the disk would be visible for just about 10,000 years, a mere blip on the astronomical time scale. That means astronomers may be extremely lucky to have found Nasty 1, and it could help them better understand the formation of Wolf-Rayet stars. It may be that these binary interactions are the primary reasons for the formation of Wolf-Rayet stars.